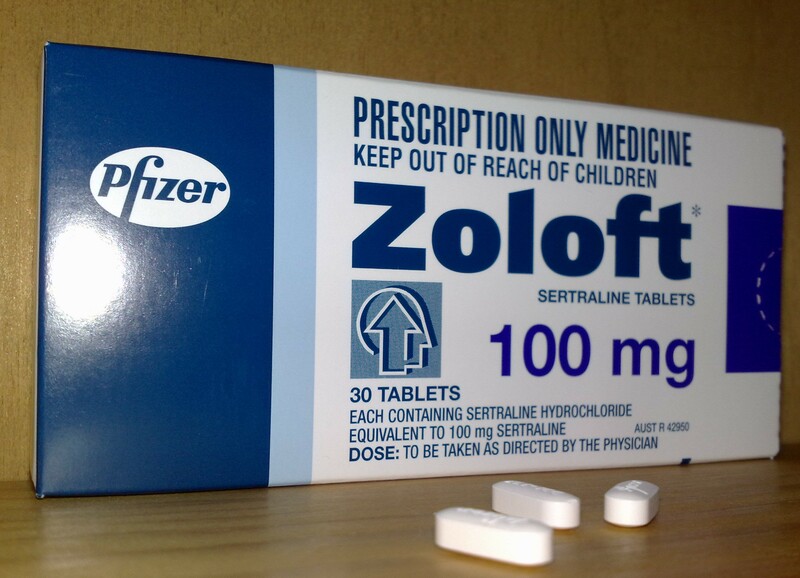 Zoloft is a brand name for the antidepressant Sertraline, which is a selective serotonin reuptake inhibitor (SSRI). This drug’s function is to increase the amount of serotonin in the brain, in order to maintain the brain’s overall chemical balance. Its positive results often include increased energy, fewer mood swings, better appetite, improved sleep patterns, and a decrease in compulsive behaviors. Zoloft is made by a Pfizer which was was founded in 1849 and is a leader in research. Pfizer released Zoloft in 1991 and it has grown to be one of the most commonly prescribed medications for anxiety and depression. Zoloft is most often used to treat depression, but is also used as treatment for panic attacks and anxiety disorders, post traumatic stress disorder, and obsessive-compulsive disorder. Less commonly, it is used to treat premenstrual dysphoric disorder (PMDD) and irritable bowel syndrome, as well as sexual dysfunction in men. The effectiveness of Zoloft as a remedy for this last problem, however, remains inconclusive. Zoloft is a serotonin reuptake inhibitor (SSRI). This means that the medication blocks the reuptake of serotonin after it is released between the synapses. This allows the serotonin to stay within the brain for a longer time. It is believed a low level of serotonin is the cause for most cases of major depression or anxiety. By blocking the synapses, Zoloft may help the brain chemistry of patients even out and decrease the depression or anxiety they feel. Not all cases of depression or anxiety are caused by a chemical imbalance and patients should discuss with their doctor the effect their medication is having on them. Zoloft can be administered in pill or liquid form. It can be taken without food but if it causes stomach discomfort, patients should try taking it with food. If taken in the liquid form it should be diluted before administered. Patients should measure the dosage with a medicine dropper and then mix with four ounces of liquid. It can be mixed in water, ginger ale, lemon or lime soda, lemonade or orange juice. Other liquids should not be used. Patients should stir the mixture and drink right away. Zoloft may cause a false positive on a drug screening test. If a patient provides a urine sample for a drug screening they should advise the staff that they are taking Zoloft. Patients should try and take Zoloft at regular intervals every day to help keep a steady level of Zoloft in their blood stream. If a dose is missed patients should take the missed dose as soon as they remember. If it is close to the time they should take their next dose they should continue as scheduled and not take an extra dose. Zoloft offers support and comfort for many patients suffering with depression or anxiety disorders. It can be used safely to help monitor the serotonin levels in the brain.